Three months after its announcement at IFA 2017, the LG V30 is finally arriving in stores. The South Korean manufacturer is placing high hopes in its latest smartphone in order to improve its image and compete with other high-end smartphones, including the Galaxy S8+. The two smartphones are in the same price category and have several similarities. LG has put a lot hope in its V30. The relatively unobtrusive career of the LG G6 forced the manufacturer to upgrade its V range, particularly by physically removing the second display. Nevertheless, LG hasn’t given up on its ambitions for 2017 and is using metal and glass for its latest device. However, the V30 is more visually consistent this time, as the edges above and below the screen are now symmetrical. The final result was a success and the V30 is certainly the most beautiful device designed by LG to date. Of course, the design on the V30 strongly resembles that of the Samsung Galaxy S8+: glass at the rear and front, rounded edges and thin aluminium frame. Although LG forges its own path, it isn’t difficult to see the influence from the other South Korean manufacturer. Either way, the Samsung smartphone offers some pretty special features with curvier edges and above all, the absence of a dual camera at the rear. The Samsung Galaxy S8 Plus is also slightly larger, thicker but less wide than the LG V30, but the handling of both devices is excellent. The positioning of the V30's fingerprint reader is easier to access, but unfortunately both devices also have the nasty flaw of leaving fingerprints on the back, despite benefiting from an excellent quality of assembly and finish. As explained above, LG has decided to remove the secondary display, which has been a feature of the V-range until recently. Ultimately, this isn't a bad decision because the V30 comes with a 6-inch OLED display (2:1 ratio) made in-house. However, LG didn’t want to disappoint the fans with this feature and instead offered a ‘Floating Bar’, which allows you to access the traditional shortcuts offered by the secondary display, and can be activated via the software. LG has decided to remove the characteristic secondary display from the V-range. The LG V30's screen has the good sense to not show the same defects as those found in the Pixel 2 XL. The color representation on the V30 is a very pleasurable and the viewing angles are satisfactory. The only concern shared by my colleague Hans-Georg is the representation of whites, which tend to have an irregular brightness when the brightness is low. The Galaxy S8 Plus features a slightly larger display (6.2-inch AMOLED) as well, but this time it’s made by Samsung. To be honest, there is little to say about the quality of the S8+'s screen. Samsung has a perfect mastery of this sector and the S8+'s display is even better than the V30. The brightness is a little higher, the colors are even brighter and the viewing angles are excellent. In short, the Galaxy S8+ is my reference point in the world of Android smartphones. Unlike the S8+, the LG V30 offers a dual rear camera: a 16 megapixel lens (f/1.6 aperture) and a 13 megapixel wide-angle lens (f/1.9 aperture). The Galaxy S8+ has a single 12 megapixel lens (f/1.7 aperture). Is the LG V30 the perfect smartphone for video? Let's just say right away, the two smartphones do very well in this area. I tend to prefer the overall image quality of the Samsung smartphone, but having a wide-angle lens on the V30 is pretty satisfying. Under the hood, the two rivals present top-of-the-range technical specifications. The V30 (Snapdragon 835 + 4 GB of RAM) and the S8+ (Exynos 8895 + 4 GB of RAM) provide more than enough for a convincing performance. On a daily basis, the two smartphones ensure perfect fluidity and worry-free gaming sessions. In short, they’re two very good devices. Samsung and LG have produced two very complete, fluid and powerful smartphones. Each smartphone has its own special features (audio for the V30 and eye-scanner for the S8+). Their photo qualities are undeniable and neither camera will disappoint you when needed. 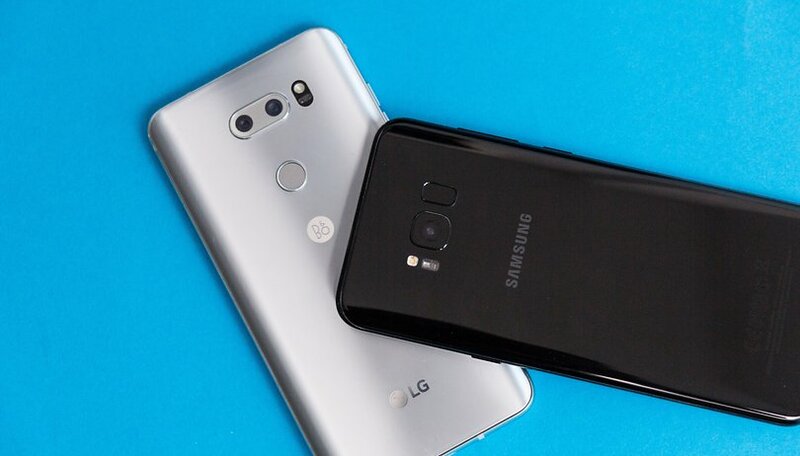 In terms of price category, the V30 and S8+ share yet another similarity with an official price of 899 EUR. While Samsung's mobile may be cheaper for the time being, LG's mobile is likely to follow the same trend very soon. If I could only pick one, I would have to opt for the Samsung smartphone, as I find it more versatile. The LG V30 currently remains a step behind my needs, but I’m definitely too picky and perhaps a little too demanding. With this device, LG has done everything possible to become one of the leaders in the smartphone market. Which one would you choose?.. Choose “LG V30” or “Samsung Galaxy S8+”. What do you think? Is the LG V30 a worthy rival to Samsung S8 Plus? I miss the ability to balance the microphones front to back when recording video with the V30. It is a feature of the V20 that I found essential in the product videos I shot outside near a highway. But, I guess that the V30 makes up for it with an even better camera and a vast improvement in battery life over the V20. And, though the V30 is stunning and svelte, as one of those active lifestyle types, I prefer the V20's tank-like build. All-in-all, though, I would (and have) chosen the V30 over all the other contenders. It's a great phone. both devices are powerful and very very capable.. I'd rather use something I like even if it's older or got lower specs..
but like Mark if I had to choose it would be LG just for the fingerprint scanner placement and camera. I would choose the LG V30 for finger print scanner location alone, never mind I think it is the better phone. The Latest Samsung location for it next to the camera is terrible. I purchased the s8plus. Very happy with. But the V30 is also a very good choice. These two phones are definitely in my top 5 choices!